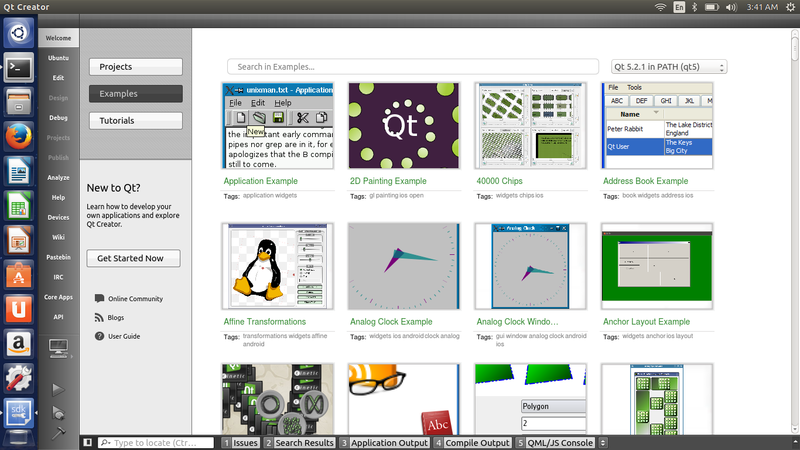 After upgrading to Ubuntu 14.04 I removed the official qtcreator in order to install the modified version from the software center because I'd like to try the SDK. Fortunately, the docs are now included in the official installation. Unfortunately, there is still something missing: the official examples. Luckily I had my old and official installation still on my harddrive and then, after some tries, I copied the examples to /usr/lib/x86_64-linux-gnu/qt5/examples and change the permission. Then QtCreator detected examples and I was able to select them from the examples section. Firstly, I am not able to find all examples e.g the network examples (like the fortuneclient) are still missing. For the sake of testing I change the permission of the example folder to 777. Therefore permission shouldn't be a problem. Secondly, some helping documents to the examples are missing. Therefore I get a normal editor and a blank right part after clicking on an example. I don't have enough reputation to comment on Sylvain's answer so my answer here is to back it up and expand as per gaoithe's comments. I had qtbase5-examples qtbase5-doc-html already installed, but was still missing network and multimedia examples (and others evidently, but these were the ones I cared about). Now I have a shed load of examples that I didn't know were missing. Then I got a substantial number of Examples shown in the Welcome Screen. Not the answer you're looking for? Browse other questions tagged permissions 14.04 documentation qt-creator qt5 or ask your own question. Ubuntu 14.04 Qt5 development libraries? Samba 4 on ubuntu 14.04 broken with Posix ACL (2:4.1.6+dfsg-1ubuntu2.14.04.9)?